Teaching is a challenging career at the best of times – working to maintain a balance between time spent in front of students, preparing for instruction, continuing to improve personally and professionally – all with a limited number of hours in the day. In addition, for STAR Catholic Schools, the spiritual development of students is also a critical element of their overall journey and teachers are expected to model a strong faith life to their students. Excelling under these circumstances is a significant achievement. 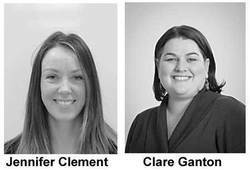 The St. Thomas Aquinas Roman (STAR) Catholic Board of Trustees and Senior Administration Team have reviewed nominations from across the Division and identified two Leduc teachers for their outstanding commitment to Catholic education. Ms. Jennifer Clement, a grade 7 teacher at Christ The King Jr./Sr. High School has been nominated for the 2014 Edwin Parr Teacher Award, and Ms. Clare Ganton, a teacher at the STAR Outreach School, has been chosen as the recipient of the 2014 Excellence in Catholic Education Award for the Division. The Edwin Parr Teacher Award is presented annually by the Alberta School Boards Association (ASBA) to a firstyear teacher who exhibits strengths in a wide range of professional skills and abilities, from their knowledge of student learning styles, to their involvement in extra-curricular and community activities, and interpersonal skills with students. Teachers are nominated for the Award by school districts and divisions across the province, and the winners are announced at the ASBA Fall General Meeting. The STAR Catholic Excellence in Catholic Education Award is presented annually to a teacher in the Division who exemplifies and models their Catholic faith for their students, colleagues and community, living that faith in all they say and do. The 2014 Excellence in Catholic Education Award will be presented at the 2014 Alberta Catholic School Trustees’ Association (ACSTA) Sharing Purpose in Catholic Education (SPICE) Retreat in May. Based in central Alberta, Saint Thomas Aquinas Roman (STAR) Catholic School Division represents 10 schools that serve the communities of Beaumont, Drayton Valley, Lacombe, Leduc, Ponoka, and Wetaskiwin. The STAR Catholic Schools team of teachers and support staff are committed to giving more than 3,200 students across our division every opportunity to achieve their potential in a caring, safe and Christ-centred environment. For more information on STAR Catholic School Division and our schools, visit www.starcatholic.ab.ca.